We stayed another night at the Sunset Motel in Bandon. There is simply so much to do in the area. The original plan was to spend day 2 in Bandon heading north, perhaps as far as Shore Acres but probably not quite to Coos Bay. However, we really wanted to keep things flexible and just see how things went. Our second day in Bandon, and third overall on the trip involved sleeping in a little bit, and staying in the overall area around the town. 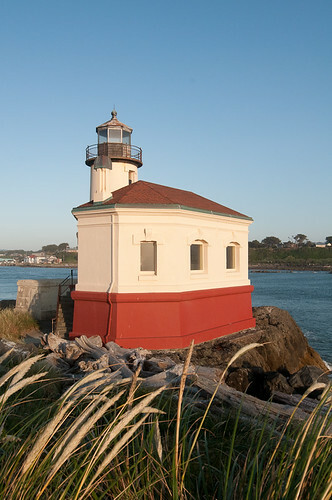 The Coquille River runs right up along “Old Town” and across from the fish and chip shacks is Coquille Light. This short, interestingly-shaped structure is in Bullard State Park, which also offers some nice dunes and what seems like all of the driftwood in the entire Pacific Northwest. The funny thing is that when one drives to Old Town Bandon the lighthouse is right across the river, and seems just a few hundred feet away (and might be less than 1000′). But to get to it one drives out of town, up 101 for a few miles, into Bullard Park then all the way down to the very end at a blazing 20 miles per hour. A lot of trouble to get to the other end of the mouth of the river. On the way back to the hotel, on Beach Loop, one has access to Coquille Point, which offers a great view down the beach and out to sea. And is also a place where the wind can practically lift you up and throw you out to the waves. Heading down to the beach from Coquille Point, one has good access to some sea lions bathing in the sun. If the wind weren’t so vicious I would have made it out a bit farther for closer pictures, but I did manage to find some refuge in the rocks and a decent vantage point. Bullard Park offers quite a bit, to be honest. Most of the park is pretty sheltered by the dunes and trees, meaning that one can do some good photography of the foliage and plants without dealing with the wind. This would be a great place for some infrared photography, actually. Heading out to the lighthouse, the beach is long but relatively narrow – most beaches seemed to be deep and flat, with big differences between high and low tides. It’s also just covered with driftwood. One wonders if somehow this beach catches everything, leaving Bandon Beach free and beautiful. As you can see from the photo of Coquille Light, there is quite a bit of driftwood out on that outcropping of rock, as well. The beach offers very nice options for one wishing to work with dunes, as well. With all the wind that we experienced on our trip, every 30 minutes or so gave a fresh, almost untouched look to the sand. The driftwood makes for interesting elements against the sand itself, as well. Of course, the sand itself against the side light of a setting sun creates very interesting textures and shapes. Finally, combining the setting sun with the grass, sand, and the lighthouse isn’t a bad idea, either. It creates a nice composition that I think is pretty subtle yet still gives all the colors that one appreciates from a nice sunset. 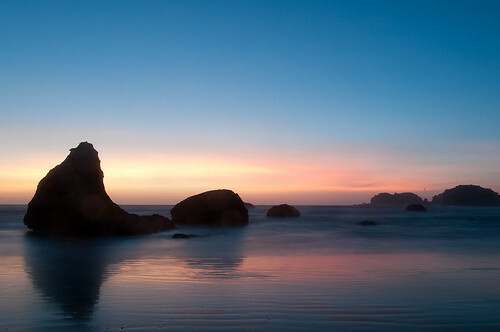 When it comes down to it, though, the sunset on Bandon Beach, with all its stacks, is the highlight of the area. It’s hard to take a bad shot, even from one’s balcony. After a few photos around the lighthouse a short but maddeningly slow drive back through the park and over to the motel brought me back down to the beach. Having gotten a bit more comfortable with the location the previous night, I played around with a bit of long exposure and different elements in the foreground. The bottom line is that from Brookings to Bandon (and eventually up to Shore Acres) is a truly wonderful area with so much variety. Next time, I would probably base myself either in Bandon or perhaps in Brookings and just work that entire area for weeks.